Need compressed, liquid and various mixtures of carbon dioxide (CO2)? In the Food and Beverage industry, carbon dioxide is a key cryogenic agent for cooling, chilling and freezing. Using CO2 also reduces the need for preservatives in packaged products, and is a key ingredient in carbonated beverages. Whether you have a beverage production facility or retail fountain, you must consider safety and environmental factors in your beverage carbonation process. The WestAir Green CO2™ is a safer and more efficient stationary CO2 system that eliminates the need for C02 venting and cylinder switching. Carbon Dioxide is used extensively in the Metal Fabrication industry as a shielding gas in the Mig Welding process. The Healthcare industry uses carbon dioxide for insufflation and as a respiratory stimulant to promote deep breathing. Please see the table below for information and to access safety data sheets on carbon dioxide available from WestAir. The Oil industry uses CO2 in oil recovery. Other oil industry applications for CO2 include energized fluid fracturing in conventional reservoirs for both horizontal and vertical wells. The Water and Wastewater Treatment industry uses CO2 as safe and lower cost alternative to mineral acids in pH reduction. Welders and Metal Fabricators often mix CO2 and argon as a shielding gas to prevent atmospheric contamination of molten metal. 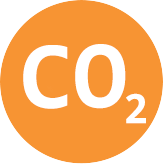 In the Pharmaceutical laboratories, CO2 is used in bench top incubators. In production, it is used in fluid chromatography. And in wastewater treatment, CO2 it is used for pH control. We deliver gaseous, compressed and liquid carbon dioxide in a variety of cylinders, vessels and containers to fit your precise application needs.